With a trip to the local grocery store — or any grocery across the United States — shoppers will find the key ingredient in many of their favorite products was produced by a Michigan-based company, thanks to S. Dattu Sastry, Ph.D., and Pushpa Sastry. The couple are the founders and owners of the flavoring company Jogue Inc. Behind these consumer-pleasing flavors lies a story of dedication, passion, hard work and a tremendous spirit of generosity that will continue to influence the lives of many people far into the future. Fifty years ago, Dr. S. Dattu and Mrs. Pushpa Sastry arrived in the United States with only an education and a determination to live the American Dream. "We emigrated to the U.S. from India, and at the time we were only allowed to bring eight dollars with us," Mrs. Sastry recalled. "We came here with those few dollars in our pockets and Dattu's doctorate degree in chemistry." Dr. Sastry began his career in the flavoring world working at a company in Northville. With his talent and ambition, he soon founded his own flavoring business in Detroit. The transition was a second leap of faith for the couple, but their hard work forged a path to success. "We sacrificed so much to build a dream," Mrs. Sastry said. "But even when we started to see success, we knew that it was important to give back. We feel a strong sense of community in Detroit, and we feel it is important to give back to our community." As their company grew, they eventually acquired the facility in Northville, where Dr. Sastry began his flavoring career. They then expanded the business to California and Florida. As their business expanded, so did Dr. and Mrs. Sastry's philanthropic drive. Their interest and meaningful involvement extends across southeast Michigan and beyond. The Sastrys wanted to represent their religious heritage in Michigan, so they provided funds to found the Novi S.V. Temple. They contributed significant funds to a chemistry flavoring society to support future generations of flavor experts. They dedicated their resources to scholarships for travel expenses, inspiring students locally and abroad to gain an education. And they have endowed funds supporting scholarship and research at Wayne State University and the School of Medicine. "I think it is just in Dattu's nature to give back," Mrs. Sastry said. "He is extremely kind-hearted and doesn't do it for the recognition, but wants to help others." With their most recent gift to the School of Medicine, the Sastrys' generosity will certainly have a profound impact on others, in perpetuity. 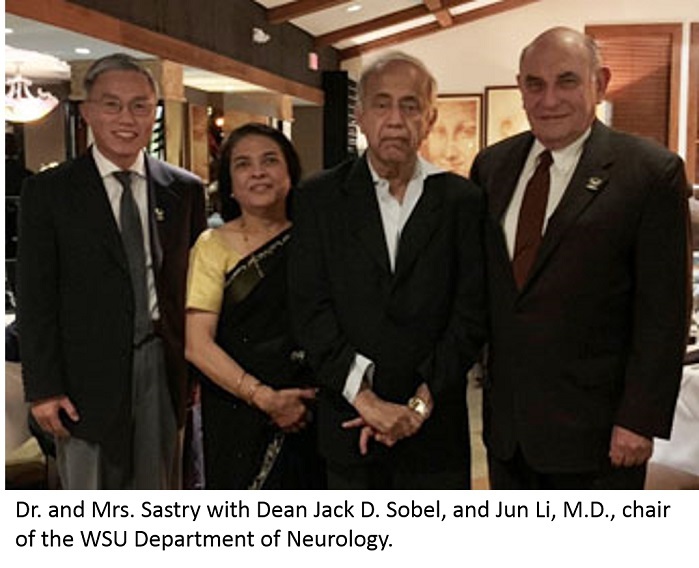 Through their family foundation, Dr. and Mrs. Sastry established the Sastry Foundation Endowed Chair in Neurology in 2018. "Dattu has had Parkinson's disease for the last 15 to 17 years," Mrs. Sastry said. "And we decided to go ahead and invest in the area that we feel will make a significant difference." The Sastrys' philanthropy will propel the Department of Neurology's research investigations for Parkinson's disease and other neurodegenerative diseases. While the expansion of the medical field throughout the course of the 21st century has been unprecedented, there are still complex neurological health issues — like Alzheimer's and Parkinson's — which do not have a cure. The Sastrys believe the Wayne State University School of Medicine's Department of Neurology has the leadership, the determination and the talent to find innovative solutions for these complicated diseases. "We had the opportunity to meet with [department chair] Dr. Jun Li, and he shared with us his vision to conduct gene therapy research, specifically as it relates to Parkinson's disease," Dr. Sastry said. "Their research has great implications for a future cure." Both Dr. and Mrs. Sastry understand the significance a fully-funded endowed chair can have in the faculty recruitment process. And they understand the impact a physician-scientist can make in this area, given the right resources and research environment. An active search has begun for the leading-edge researcher who will hold the Sastry Foundation Endowed Chair. "The gift from the Sastrys will have a tremendous impact on our efforts," said Jun Li, M.D., Ph.D., chair of the Department of Neurology. "Endowed chairs bring prestige to the school and to our department, making us highly competitive in attracting and recruiting world-renowned physician-scientists to our team. I know that the talented faculty we bring on board will use this opportunity to make waves in neurology and great strides in our understanding of Parkinson's disease." The Sastry Foundation Endowed Chair will also play a monumental role in retaining world-renowned faculty once the new chair holder has been recruited. "I know we will be successful in recruiting the next leader in neurology research," said Jack D. Sobel, M.D., dean of the Wayne State University School of Medicine. "Dr. and Mrs. Sastry's generosity is exceptional. Their philanthropy serves as a heavy-hitting vote of confidence in the School of Medicine, our tremendous research faculty and the communities we serve. Their philanthropic partnership allows us to redouble our efforts in the field of neurology, which will result in tangible clinical advancements." The Sastrys' commitment to Wayne State extends beyond their substantial philanthropy. Their son, Anil Dattu Sastry, J.D. '03, is an alumnus of the Law School and serves as the chief executive officer of family company, Jogue Inc. Ashok Dattu Sastry, M.D. '01, is an alumnus of the School of Medicine and practices nephrology in Sarasota, Fla. The connection they feel through their children, and their unwavering belief in both the School of Medicine and Wayne State, has led to their legacy of support. "Money becomes unimportant when you reach a certain age, so use it for a good cause," Mrs. Sastry said. As philanthropists and business leaders, the Sastrys have generously given back to Detroit and to the School of Medicine, marking a new course for neurological research and setting a spectacular example of what it means to make a difference. To learn more about supporting the School of Medicine or the Department of Neurology, contact Lori Robitaille at 313-993-4070 or lrobitai@med.wayne.edu.